følelsen av å eie. Av å romme noe utenfor meg selv. Å inkludere mer, gjorde kroppen lettere å bære. Jeg behøvde ikke å anstrenge meg så mye. 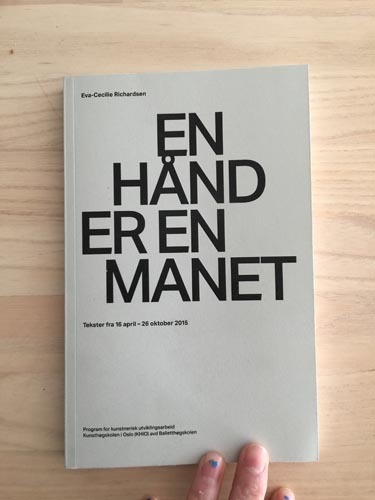 (…) The book, “A hand is a blade” contains texts, in both Norwegian and English, that span diaristic entries commenting upon her working processes, comments upon themes, issues and ideas encountered underway, observations and short narratives, often with a memorial character. The style of writing is non-academic, personal, close to artistic practice. 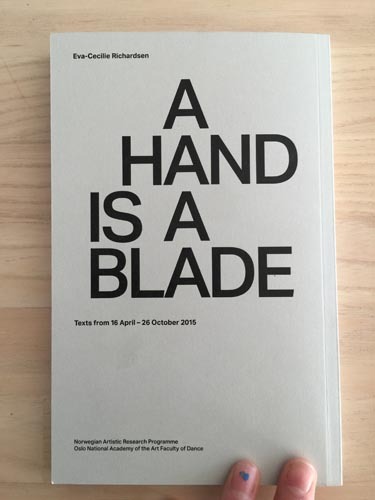 (…) In the afterword to “A hand is a blade”, Richardsen writes “I consider that, taken as a single whole, the work functions precisely when allowed to speak for itself; it both highlights and manifests questions concerning choreographic implications that traverse the boundaries of various disciplines and discourses; it amounts to a meta-level negotiation about space and verbalisation, methods and processes - issues relating to work demarcation, autonomy, forms of documentation, presentation and display”. It is perhaps tempting to infer that the latter is a kind of manifesto for the future development of her practice. (…) Elsewhere in “A hand is a blade” Richardson states “It strikes me that my work is thoroughly methodically sporadic, and not the other way round. I strive to maintain a focus on what is determined not be objectives, but by opportunities.” - a reflective comment that can usefully be applied to her body of work as a whole.